Russia has denied providing Saddam Hussein with intelligence on US military moves in the opening days of the US-led invasion in 2003. "Similar, baseless accusations concerning Russia's intelligence have been made more than once," a Foreign Intelligence Service spokesman said. A US Pentagon report said Russia passed details through its Baghdad ambassador. One piece of intelligence passed on was false, and in fact helped a key US deception effort, the report said. The report also quoted an Iraqi memo which mentioned Russian "sources" at the US military headquarters in Qatar. "The information that the Russians have collected from their sources inside the American Central Command in Doha is that the United States is convinced that occupying Iraqi cities are [sic] impossible," said the Iraqi document, quoted by the Pentagon report. The false intelligence apparently passed on by Russia concerned the date the US was likely to start its main attack on Baghdad. A document from the Iraqi foreign minister to Saddam Hussein, dated 2 April 2003, and quoting Russian intelligence, said the attack would not begin until the Army's 4th Infantry Division arrived about 15 April. This reinforced an impression that the US military were trying to create, in order to catch Iraqis by surprise with an earlier attack, the Pentagon report said. 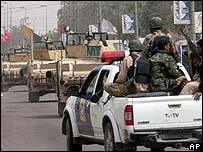 In fact, the assault on the Iraqi capital began well before the 4th Division arrived, and the city fell about a week before 15 April. The same Iraqi memo said that US troops were moving to cut off Baghdad from the south, east and north. "Significantly, the (Iraqi) regime was also receiving intelligence from the Russians that fed suspicions that the attack out of Kuwait was merely a diversion," the report said. The Pentagon report noted that there were Russian business interests in Iraqi oil, and a senior US military spokesman said Russia's actions were being seen as "driven by economic interests". The report also said Saddam Hussein's inept military leadership was a key factor in the defeat of his forces. "The largest contributing factor to the complete defeat of Iraq's military forces was the continued interference by Saddam (Hussein)," it said. 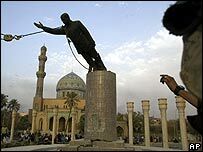 The BBC's Pentagon correspondent, Adam Brookes, says that overall the report portrays Saddam Hussein as chronically out of touch with reality - preoccupied with the prevention of domestic unrest and with the threat posed by Iran. The 210-page report - Iraqi Perspectives Project - aims to help US officials understand in hindsight how the Iraqi military prepared for and fought during the invasion. There are both classified and unclassified versions of the report.